Get a Free Trial ! “Some of those earliest items are still in service today and it is their reliability, durability and our continued technical innovation that ensures Chart products remain the industry benchmark,” said Chart. “Originally developed for the safe, economical and convenient transport by road, rail and water, of atmospheric and technical gases for industry and leisure; the standard 20-feet and 40ft containers are also now widely used for LNG and are key components in Chart’s small-scale LNG solutions, facilitating the use of natural gas as a clean-burning, economical fuel alternative to diesel and other distillates,” the company explained. Chart said ISO containers were integral to its skid-mounted Natural Gas Vehicle fueling stations, onboard ship-fueling systems, satellite stations and even feature as tender cars for natural gas-powered locomotives. 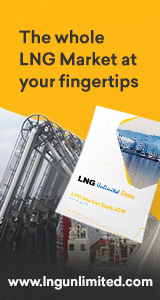 The US company noted that in 2016 Chart delivered an LNG solution enabling the power station on the Portuguese island of Madeira to burn natural gas, despite not being connected to the pipeline grid. Chart is currently consolidating its core business of LNG and recently entered into an agreement to acquire its smaller US sector rival Hudson Products Corp. for $410 million in cash. Hudson, based in Beasley, Texas, makes a range of heat-transfer equipment for the refining, petrochemical, natural gas and other industrial markets. Hudson is a North American leader in air-cooled heat exchangers (ACHXs) and a global leader in axial flow cooling fans. The Texas company was majority-owned by equity funds managed by Riverstone Holdings. The air-cooled heat exchangers will widen the product range for Chart and improve its offerings as it makes a place for itself in the small-scale and medium-sized LNG plant sector. The acquisition comes as Chart continues with the moving of its corporate headquarters from Garfield Heights in Ohio to the town of Canton in the state of Georgia, expected to be completed by the end of 2017. Chart has also restructured to concentrate on its energy and LNG businesses as it has sold non-core assets and cut costs across the group. The restructuring was initiated under the previous leadership of Sam Thomas who has now handed over to new President and Chief Executive Bill Johnson.